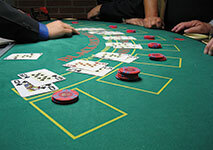 Blackjack is one of the most popular casino games that can be won by using a reliable strategy. This is the reason why many players try different methods in order to determine which one works best. Throughout the years, many gaming experts have developed a number of strategies in an attempt to increase their chances of winning. Even though all of them operate on a different principle, they have one thing in common – they aim at providing players with the best possible choice for their hand. By applying an efficient strategy, it is possible to become a consistent winner and most importantly, retain the winnings. However, in order to do so, players should be able to fully understand the basic principles of their chosen strategy and its subtleties. One of the most popular strategies that is used in a number of table games, including blackjack, is the so-called 1-3-2-6 betting system. It attracts hundreds of players as it is both simple and efficient. 1-3-2-6 betting system is a moderately simple system, even though seemingly it appears to be a rather complicated one. It is suitable for all types of players, regardless of their experience and gaming style, as all it takes to apply it properly is to learn its pattern and principles. As its name indicates, the main idea of this system is to bet 1,3,2 and 6 units in sequence and this way make a profit by following the winning stakes. It highly resembles another popular betting system – Paroli as it is also based on the assumption that players can win four consecutive times in a row. Both consist of a betting cycle which is completed at a certain point. For instance, if players lose three bets, they should start again from the beginning and bet the first unit and continue to do so until they get lucky and win. Every time they lose, they should start the betting from the beginning in order to apply the system correctly and make it work. The same goes for the time when they place the last betting unit as this way the game cycle is completed and they have to start all over again. It is essential to remember that this betting system can be only applied on the condition that players win consistently. Just like Paroli, the 1-3-2-6 betting system is a positive progression one, meaning that players need to increase the amount of their bet every time they win. The first thing that should be done prior to playing is to decide the exact amount of one betting unit. In order to do so, players should take into account their available bankroll and the betting requirements of the table. They should also remember that the initial betting unit is the minimum amount of money that they will have to bet every time. Whenever they place a bet and win, they need to adjust their next wager according to the 1-3-2-6 system in order to make it work. For instance, let’s assume that the amount of money that should be wagered for every unit is set to $5. The initial bet that players need to place is $5 and if they win, they should increase the amount to $15 which should be their second bet. If they continue winning, their third wager should be $10 and the forth one – $30. After that, the game cycle is completed and players should start again from the beginning by placing a $5 bet. This system is especially effective for bets that pay out even money which is the reason why it is used in so many table games. In order to make it work, players should adhere to its simple rules throughout the whole game as this is the only way to achieve the best results. In order to draw the final conclusion whether this system is truly beneficial, let’s have a look at its possible outcomes. The 1-3-2-6 betting system has a very short betting cycle which is the reason why it is fairly easy to predict all of the consequences that might occur during the game as a result of following its pattern. If players place their first bet of $5 and lose the hand, then their total loss will be this single betting unit. In case that they win the first bet, however lose the second one, then they will lose two betting units. If they win the first two bets, but lose the third wager, then they win 2 betting units. In case they win the first three bets, but lose the fourth wager, then the result is breakeven. The best-case scenario is when players win all four bets as this way they have made a profit from 12 units. Therefore, due to the fact that there are only two losing outcomes, it can be concluded that this system is indeed efficient. When it comes to blackjack, the 1-3-2-6 betting system can be really beneficial. If applied properly, it can help players reduce their money losses significantly and this way play for much longer. Thanks to this strategy, they can manage their funds better and make wiser betting choices. Another significant advantage of this system is that it is fairly easy to learn which makes it suitable for all types of blackjack players. It prevents gamblers from losing money as they don’t have to increase their wagers if they are losing continuously. Furthermore, after four consecutive wins, the betting cycle is completed and players should start from the beginning and wager the first unit. Thus, in any case, they will be able to retain a small profit. However, this betting system has also some drawbacks which should be considered. Perhaps, one of its biggest disadvantages is the fact that it doesn’t help players reduce the house edge in any way. Even though blackjack has a moderately low built-in house edge, after all it is completely enough to prevent players from winning which is the reason why the casinos offer the game in the first place. Another thing that is worth discussing is the fact that the forth bet that players need to place should be increased 6 times the initial amount which carries a large amount of risk. In blackjack, it is not possible to completely predict whether a particular hand will be a winning one. This is the reason why players should proceed with caution when using this strategy as sometimes it can place them in a very tricky situation. The 1-3-2-6 betting system has proven to be very efficient as it prevents players from losing a substantial amount of money. Many blackjack enthusiasts use it in an attempt to make wiser betting choices and increase their chances of winning more money. It is easy to use and it can truly help players increase their winnings. However, due to the fact that this system doesn’t decrease the house edge in any way, it is not recommended for more serious players who want to improve all of the aspects in their game.